Things are growing around here – no doubt because the regular rain showers interspersed with blasts of sun is taking care of the garden more consistently than I ever have. And having previously lived with a sad and severely balding back lawn, ravaged by kids and peed on by dogs, we’ve managed to bring it (almost) back to life with copious quantities of grass seed and a strategically placed monkey statue, rescued from a friend’s flooded basement and brought home to clean, to keep the birds from eating all of it. (The seed, that is.) Which is all to say it’s worth sitting in the back yard again this year. I was craving something sticky-sweet and grilled, preferably something made of pig, something like ribs, only leaner but no less sticky. Molasses and bourbon did the trick, along with fresh garlic and ginger and grainy mustard and soy sauce for saltiness. Molasses is often overlooked for savoury dishes, but I find myself using it more and more for marinades and sweet barbecue sauces – it goes particularly well with pork. (Crosby’s has a great selection of free e-book downloads here.) 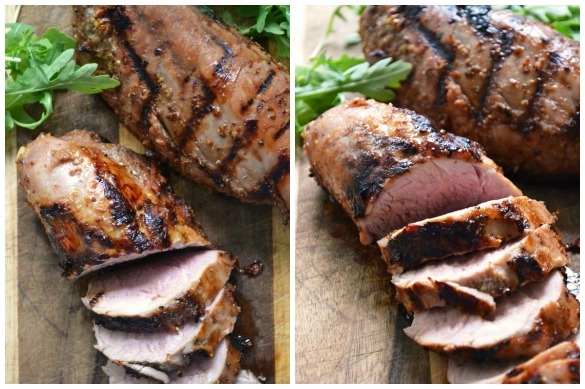 And speaking of pork, a tenderloin is perfect for grilling; its long, thin shape means it doesn’t take too long on the grill, and it has great flavour and texture. I made two, so that the second could be sliced thin and made into grilled molasses-bourbon pork sandwiches with arugula on a long, buttered baguette, to pack for a road trip. Picnics by the side of the road, at a picnic table in the trees or planted on a big rock with your feet in the river, are the best, aren’t they? or on the soft sand at the beach? Of course, grilled molasses-bourbon pork sandwiches are just as tasty planted on the grass in your own back yard. This recipe is pretty simple – pour the marinade ingredients into a big zip-lock bag, add the pork, seal it and leave it in the fridge overnight (or freeze it ahead of time – the marinade will protect the pork from freezer burn) – when you take the meat out to grill, you could simmer the remaining marinade on the stovetop – let it cook for a few minutes, which will cook it through and thicken it up to brush over the tenderloin as it grills, or dribble over your sandwiches. Yum. 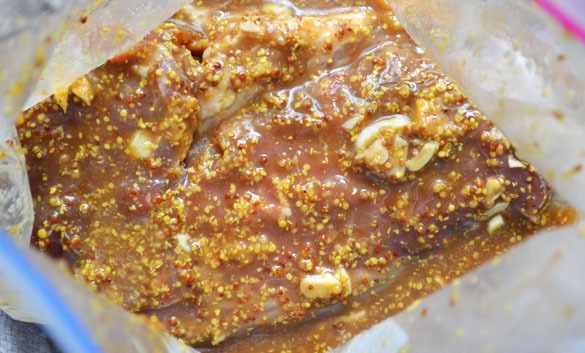 1Combine all the ingredients in a large ziploc bag, squish it around with your hands to blend and coat the meat well, and marinate in the refrigerator overnight. 2Cook on a preheated grill, turning frequently, for 15 to 25 minutes, brushing with sauce, until the internal temperature is 165°F. Slice in 1/2-inch thick slices to serve as a main course, or in thinner slices to make sandwiches. * This post was generously sponsored by Crosby’s Molasses – but I chose the recipe and the words and thoughts are my own. Thanks, Crosby’s! Yum, your pork looks amazing. I’m a big fan of ribs but can’t do the whole eating something named after exactly what body part it is thing. This looks like a tasty compromise. So happy I’ve come across your blog! This looks amazing. I would certainly make two too. Plenty of leftovers. I am all over this. Yum. 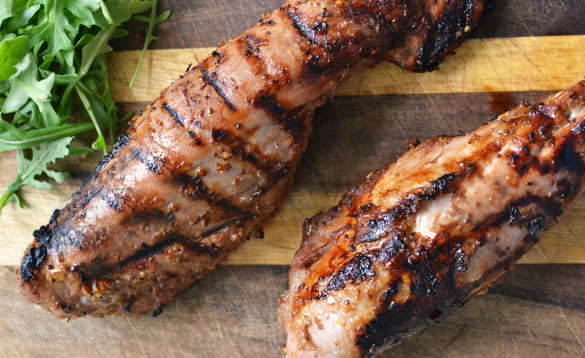 One of the best meals we ever had was one that was frozen in its marinade. It really permeated the meat and the results were so tender and juicy. brilliant! this is happening in my kitchen, and SOON. This may have to be added to the camping menu! Make it ahead, freeze and cook up over coals..mmmmmm. One of my favorite Asian ingredients, kecap manis, pretty much tastes like molasses and soy sauce, so I am right there with ya. And this looks fantastic–pinning now!